Twelve months ago Blossoms were playing third on the bill at the Ruby Lounge. Tonight they're headlining Gorilla, having supported some of the city's favourite sons on the way. Like everything else that's been put in front of them in that time they take it effortlessly in their stride on an irresistible march to bigger things. Coming on fashionably late and now with two of their crescent moon and stars behind them on the Gorilla backdrop, there's a buzz of anticipation in the room from the dewy-eyed teenagers to the older grizzlier veterans of the Manchester live scene. Blossoms appeal to all ages more than any other band in their peer group, testament to their fusion of influences that run through their songs but which create something undeniably modern and fresh. They start with single-that-wasn't You Pulled A Gun On Me and whilst Gorilla's sound is characteristically muddy tonight it doesn't dampen the organ-driven psychedelic melancholia of the song, surely a candidate for a proper release soon. Lava and recent b-side The Urge are beasts of songs, sprawling journeys that show Blossoms are no hit-and-run three minute wonders replicating variations of the same song like so many hyped bright young things. Their set is perfectly paced as well, there's hints of funk in Scattered Rain, Smoke showcases a darker heavier side to their sound and then it's followed by the beautifully simple yet emotive acoustic strum of My Favourite Room. Our favourite though is Blown Rose, a gorgeous melody and harmonies and wistful romantic thoughts from life on the road combine to melt the hearts of the six hundred or so in the crowd. Madeleine allows guitarist Josh space in the breakdown to let loose, although, like everything Blossoms do, it's not for show. They close the main set with Cut Me And I'll Bleed, their recent single and it gets the best response of the night, not surprising given the exposure it's had. There's a group of lads at the front and this is the first time they respond by moshing, albeit gently. Blossoms are growing at such a rate that most of the audience don't know more than a few songs, but crucially, this isn't a problem yet, such is their ability to win new people over on a regular basis. For the encore they start with b-side A Winter's Kiss and they ask the crowd for silence for the intimate quiet track that shows yet another side to them. After a bit of cajoling the crowd accede to their request with a few exceptions. They conclude matters with a rampant Blow, the extended outro of the song the perfect crescendo of a set that's perfectly paced and shows the diversity and range of Blossoms' sound. The excited buzz that remains in the room after they've left the stage shows that, as they've done throughout the past year, they've cast their spell once again. 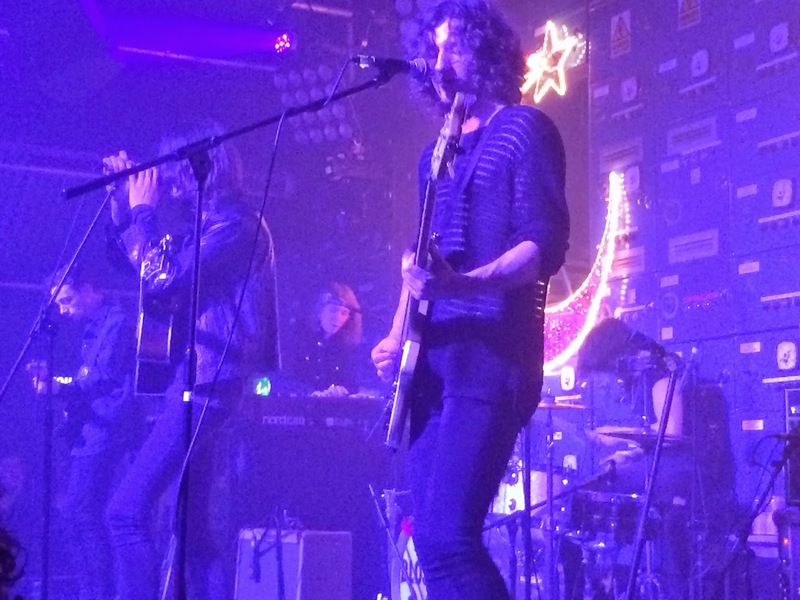 Tonight proves that Blossoms' rise is becoming increasing unstoppable. It's one thing playing a support slot to an established band where most people know very little about you. Tonight the expectation was on them, Gorilla was a big step-up and they more than delivered. Blossoms played You Pulled A Gun On Me, Lava, The Urge, Scattered Rain, Smoke, My Favourite Room, Blown Rose, Madeleine, Cut Me And I'll Bleed, Winter's Kiss and Blow.